They are absolutely stunned with my answer: mayonnaise. Using mayo as a key ingredient may sound unusual for us over on the East coast, but it’s actually a pantry staple for many in the South. Mayo adds a richness and moistness to any dish from savory items like fish to sweet chocolate cake. Yes, I said chocolate cake. So where did mayo and I become so acquainted? My mother’s side of the family is from a tiny town called Montezuma, Georgia, and I spent a good amount of time there during my childhood. I had a boring palate then, but there was a constant flow of traditional southern specialties that crossed the dinner table: ham and eggs, boiled peanuts, vidalia onion (so sweet my uncle ate ‘em like apples--yes, the same uncle that ate chicken livers for breakfast), collard greens, black-eyed peas (sorry, still can’t love these), brunswick stew, ribs, cornbread, biscuits and gravy, barbecue, fried chicken, grits, hush puppies, sweet potato pie, Divinity at Christmastime, corn-, peach-, or pecan-anything (and pecans no less from the tree in their yard--something grandpa always shipped us up north each year). Oh, and no surprise, my bologna sandwiches always had mayo on it (still true today). When I need a food hug, I make bologna with mayo on white bread. That about puts me back to a sunny day at elementary school eating my sandwich from my lunchbox. I have to admit though that watching my uncle eat chicken livers for breakfast was unappealing--and that probably may be one of the reasons you wouldn’t label me a true southerner. Then I grew up. And opening the bakery keeps bringing waves of nostalgia. I miss those carefree days, but I can travel back to moments in time through food. And more than that, there’s a warmth to Southern hospitality. There’s just nothing like being greeted when you’re down South and every goodbye has “Y’all come back now, ya hear?” You see, there’s a certain warmth and ambiance attached to the South. You are welcomed, paid attention to, taken care of, and leave happy (and full). I’ve always strived to embrace my Southern roots in both my baking and business style. At AMIE Bakery, we try to impart a bit of that southern charm, northern style. Our joy comes from watching people come in with smiles and leave with bigger ones. We want our customers, who we think of as our friends, to experience that same hospitality. We work hard to create a reminiscent neighborhood bakery where, even if just for a moment, you feel like you’re sitting around a dinner table with family and old friends. Interested in tasting some of our Southern best sellers? Check out our buttermilk glazed carrot cake or hummingbird cake today! Starting a business from the ground up — especially one that was new to me (food service) — was daunting, exhausting, exhilarating, interesting, and complex. Building a following and building a team (I have the best) does not happen overnight, and in the beginning not having either in place left many unknowns. But I believe so strongly in our mission and that we are truly filling a need in our community. There is so much manufactured food that many people don’t understand or know what real tastes like. At AMIE Bakery, we do something that many places don’t. We use whole ingredients. We crack every egg. We make all our fillings. We zest and juice our citrus to make the best fruit curds. While this costs more and is labor intensive, we think it’s worth it. Fortunately, my persistence has not gone unnoticed. This past year, we were named Best Bakery by Cape Cod magazine in our seventh month of operation. We’ve also been featured in Cape Cod magazine’s Food and Restaurant section, Edible Cape Cod, Cape Cod Times, the Barnstable Patriot, and this March our AMIE Academie will be featured in Cape Cod Home magazine. The growth of our following on social media has also been exciting as we’ve recently gained a global following. In fact, we’ve already had a few international orders. These victories have not come without challenges — some of which have been the most difficult I’ve ever faced. One is something I’ve always known. There are no shortcuts and to produce a quality product day after day requires integrity, commitment, and consistency. I’ve seen this mantra trickle down to every aspect of running my small business. For example, when I opened our storefront, a case of eggs was $19.95 for 15 dozen. They have been as high as $45 and are now in the $30-35 range. Since we use whole eggs in our recipes—no liquid eggs which have preservatives—this impacts our bottom line. However, it is important to me to remain true to our mission. To get to where I am today would have been impossible without the support of some very key folks. First, I need to thank my staff. Your business is only as good as your people and I value them—not only are they great people, but also loyal and dedicated to our mission. Without them, the bakery’s success would not be possible. Of course, no business can remain viable with customers. I am grateful to the countless number of people who have gone out of their way to personally thank me for having the bakery in town and complimenting us on our baked goods, our décor, and the service they receive from the staff. I consider it the community kitchen and the space itself has a storied past so it’s an honor to be part of Osterville’s history now. We have worked tirelessly to promote not only the bakery but also make sure that we promote Osterville—it’s a great village with lots of charm and beautiful stores and eateries. Lastly, I am grateful to my family and friends—it was a long process from vision to reality and I have made many sacrifices along with hard work. There will always be naysayers when you have a dream, but if you stay steadfast in what you want and work hard, you can do anything. As we move into the new year, my hope is to expand our AMIE Academie. Teaching is my other passion and it’s nice to blend my passion for baking and teaching. I am looking forward to 2016 and for another year of learning, love, and lots and lots of flour. Have a wonderful new year! We’ll see you soon! My staff at AMIE Bakery would be the first to tell you how much I love kitchen gadgets. Going into a restaurant supply store or NY Cake Supply gives me the same rush as a DIYer gets walking into Home Depot. Upgrading your kitchen for baking may seem like an ordeal, however, the reality is that you really only need a handful of tools. These are also the ones I also share during our classes at AMIE Academie. Bench Scraper: The workhorse of the kitchen, this tool makes fast work of portioning dough and cutting butter into cubes as well as picking up ingredients and scraping off your surface. Offset Spatula: The bent portion of this tool makes it easy to reach all the tight spots so you can spread batter in a pan or frost a cake with ease in no time. It is available in many sizes and is used daily— once you have it you will wonder how you lived without it. We’re in love with Ateco (plastic handle versus wood). Immersion Blender: This is the magic wand that makes blending and creating emulsions fast and easy. Salad dressings are a cinch and sticking it in your pot of soup to blend can save time, cleanup, and make it safe by not having to transfer liquids to a blender. 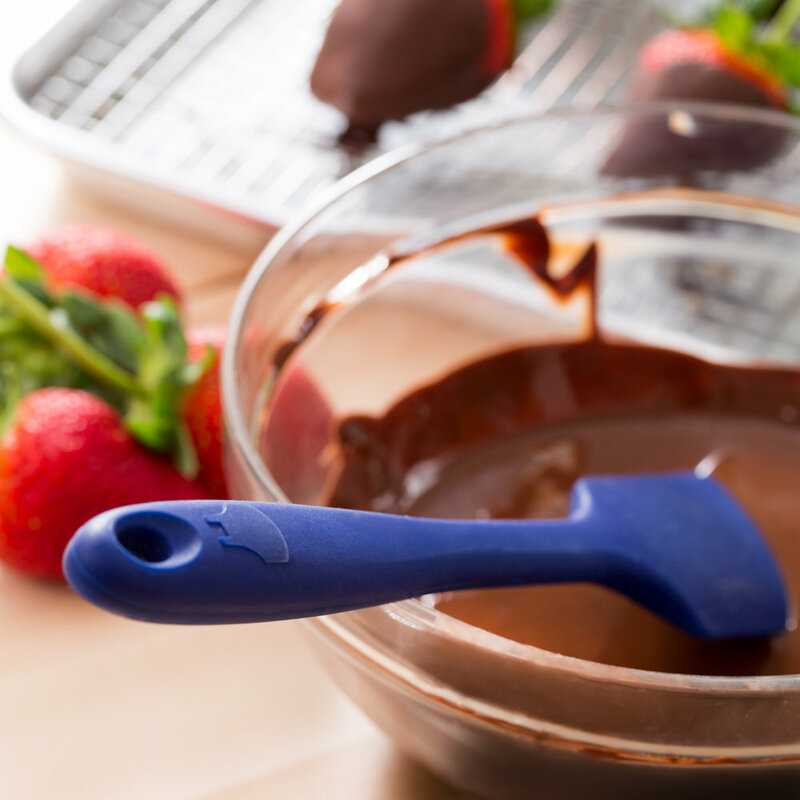 Heat-proof Silicon Spatulas: This tool makes mixing ingredients and scraping the bowl fast and easy! The handle never gets hot and a quick run through the dishwasher makes cleanup a snap. Microplane: This is your citrus fruit’s partner in crime. Getting some zest is a snap with a microplane, and this handy tool is great for shaving chocolate and cheese too. Our preferred brand is OXO. Bowl Scraper: After kneading dough or making batter, there’s always some that likes to stick to the bowl. This neat tool cleans off the bowl and ensures you get every delicious drop, which also ensures less waste and proper recipe yields—and in the bakery, that’s important. Ice Cream Scoop: Who says ice cream scoops are just for ice cream? For accurately measuring batter, the best tool for the job may be found at your local ice cream parlor. Available in different portions, using the ice cream scoop ensures consistency in your sizes so everything bakes evenly. Mixing Bowls: Simple and simply practical. The metal mixing bowl acts as the foundation of baking by literally bringing everything together. Sheet Pan: Whether you bake or cook, you’ll use this every day whether you’re roasting a chicken or baking a dozen cookies. We prefer stainless steel and our favorite brand is Chicago Metallic. Mixer: KitchenAid is the most prevalent brand, but any electric mixer can take the load off of stirring by hand. Arguably, the best tool is your hands so even if you don’t have a mixer you’re already starting with the most essential tool. So what are you waiting for? Get kneading!